We manufacture and supply Fully Auto Strapping Machine. They are available with us in two ranges- top roller driven and top belt driven. They can be operated independently or combined with conveyers for auto packaging and unmanned strapping system. The table top can be easily opened for an easy maintenance. Strapping position can be adjusted by moving the location of sensors. They are built for continuous operation. 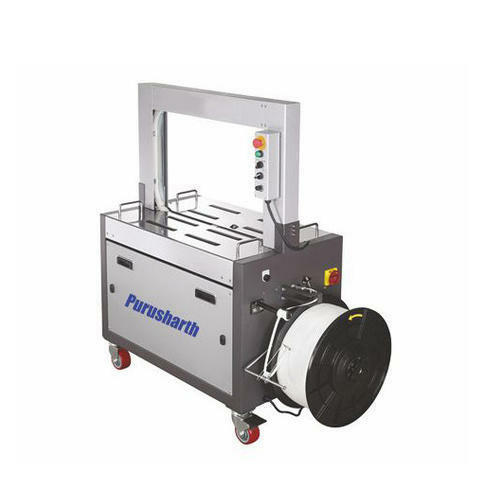 We, Purusharth Packaging, established in 2005, has an experience in the field of manufacturing and supplying a comprehensive range of Packaging Machines and Material. Our range of Packaging Machinery includes Shrink Wrapping Machine, Vacuum Packing Machine, Continuous Bag Sealer, Foot Operated Machine, Hand Sealer and Induction Sealer. In addition to this, we also have Box Strapping Machine, Foil Sealing Machine and Cap Sealing Machine in our range. These machines are well appreciated for their superior quality, high performance, flawless finishing, low maintenance and power efficiency. Further, we also offer a range of packaging material that includes PVC Shrink Role, PVC Shrink Label and Aluminum Foil Lids. Manufactured using high grade raw material & components and latest technology, our entire range of products conforms to the international quality standards. We have a team of experienced quality experts, which makes sure that the raw material are procured from quality assured vendors. These experts supervise the whole process of production and supply, so that we deliver defect-free products to our clients.